Ian from the group is doing work on the old Liverpool workhouses leading up to the building of the new Royal Liverpool Hospital. On his travels he came across the plaque shown here on the wall of the old redbrick infirmary. 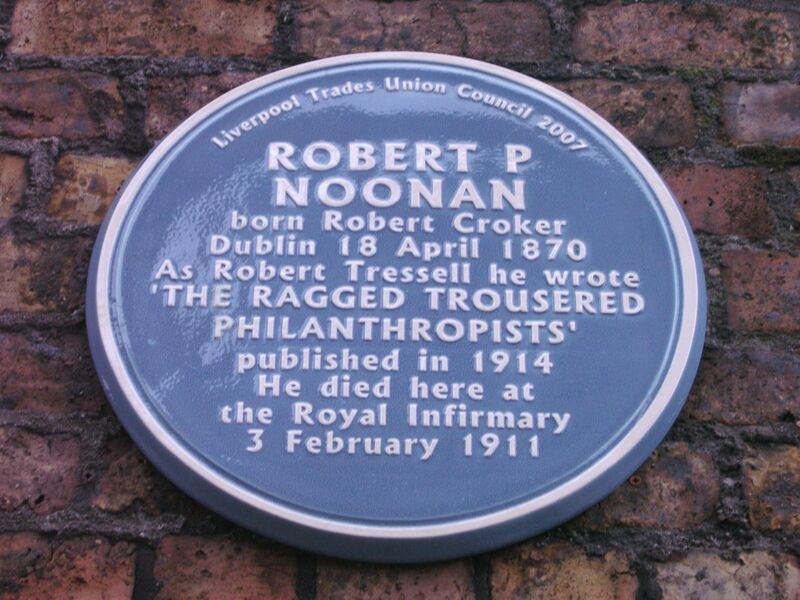 “Tressell” was the pseudonym of Robert Noonan, who died a pauper in the hospital. Only after repeated efforts by his sister did his famous book find a publisher. Set in a fictional “Mugsborough” but based on Hastings and the painting and decorating jobs he worked in, the philanthropy of the ragged trousered refers to the generosity with which they give so much to the rich while remaining poor themselves. The Liverpool actor Ricky Tomlinson described it as a book that changed his life: he was given it while serving a prison sentence in the 1970s after taking part in a picket dispute on a building site. A play version of the novel was shown in Liverpool earlier this year, and Tomlinson talks about it here. Copies of the original text have been displayed in Liverpool’s Central Library, currently undergoing rebuilding. By the way, the name “Tressell” was chosen to resemble the trestles used by painters and decorators. You can read an extract from the novel below. … Owen proceeded to cut up one of the slices of bread into a number of little square blocks. … Owen now addressed himself to the working classes as represented by Philpot, Harlow and Easton.